According to R. Nissim (quoted in Tos. R. H., l.c. ), Isaac Alfasi, and others, the thirteen middot begin only with the second "Adonai," since the first one is the subject of "wa-yiḳra" (and he proclaimed). To secure the number thirteen, some count "noẓer ḥesed la-alafim" as two (Nissim in Tos. l.c. ), while others divide "erek appayim" into two, since forbearance is shown both to the good and to the wicked (comp. the gloss on Tosafot, l.c. and Ibn Ezra, l.c. ), and still others end the thirteenth middah with "lo yenaḳeh" (he does not pardon; Maimonides, "Pe'er ha-Dor," p. 19b), Lemberg, 1859), this being considered a good quality, since through punishment man is moved to repentance, after which he is pardoned and pure (comp. Yoma 86a; Aaron b. Elijah, l.c. ; and "'Ez ha-Ḥayyim," ch. xcii.). Others term "we-naḳeh lo yenaḳeh" a single middah, the thirteenth being, in their opinion, "poḳed 'awon abot 'al-banim" (visiting the iniquity of the fathers upon the children), "this being regarded as compassionate since the transgressor is not punished immediately" (Maimonides, l.c. ; Aaron b. Ḥayyim, l.c. ; comp. also "Da'at Zeḳenim"). The general usage is based on the view of Leḳaḥ Ṭob, R. Tam, and Ibn Ezra, and the various recitations of the thirteen middot begin with the first "Adonai" after "wa-yiḳra," and conclude with "we-naḳeh." They must not be recited by only one person in prayer (Shulḥan 'Aruk, Oraḥ Ḥayyim, 565, 5), but by an entire congregation, which must consist of ten persons at least ("minyan"). They are recited on every holy day—not on the ordinary Sabbaths—when the Torah scroll is taken from the Ark, and it is also customary that on the fast-days on which Ex. xxxii. 11-14 and xxxiv. 1-10 are read, the reader stops at the word "wayiḳra" in order that the congregation may recite the thirteen middot, after which he continues his reading. The thirteen middot are very frequently recited in penitential prayers, in some of which they have even been hypostatized and are invoked, asinferior celestial beings, to aid the prayers of Israel and to present them before God. This is especially the case in the seliḥah of the eve of the New-Year, which is repeated at the morning service on the Day of Atonement, and which begins with the words "Shelosh 'esreh middot," and in the pizmon of Amittai b. Shephatiah for the fifth day of repentance, which is recited also at the evening service on the Day of Atonement, and in which the "middat ha-raḥamim" (compassion) is particularly invoked. On fast-days as well as during the week before the New-Year (the so-called seliḥot days), and on the days between the New-Year and the Day of Atonement, called the days of repentance, many penitential prayers ("seliḥot") are recited in addition to the usual daily prayers. After every such petition the thirteen middot are recited with their introductory prayer, the well-known "El Melek yosheb," which runs as follows: "Almighty King, sittest on the throne of mercy, showing forth Thy compassion, and forgiving the sins of Thy people by ever taking away their former guilt, ofttimes granting pardon unto sinners and forgiveness to the transgressors, making manifest Thy goodness both to body and to soul, nor punishing them according to their iniquity; Almighty One, as Thou hast taught us to recite the thirteen [middot], so remember now the thirteenfold covenant, as Thou didst in former days proclaim it to the modest one [Moses], even as it is written . . ." (then follow the verses Ex. xxxiv. 5-7a and 9b). 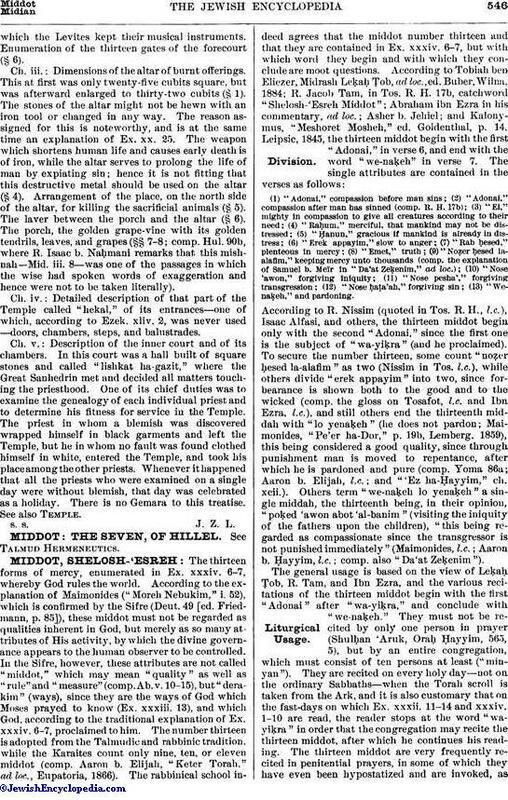 The importance attributed to the thirteen middot in this prayer and the potency ascribed to the recitation of them in the penitential prayer are based upon an overliteral and partially erroneous interpretation of a passage from the Talmud, which runs as follows (R. H. 17b): "After God had proclaimed the thirteen middot to Moses, He told him: 'As often as Israel shall offend, thus shall they do in My presence, and I will forgive them.' Rab Judah says that a covenant was made that the thirteen middot should not be without effect." 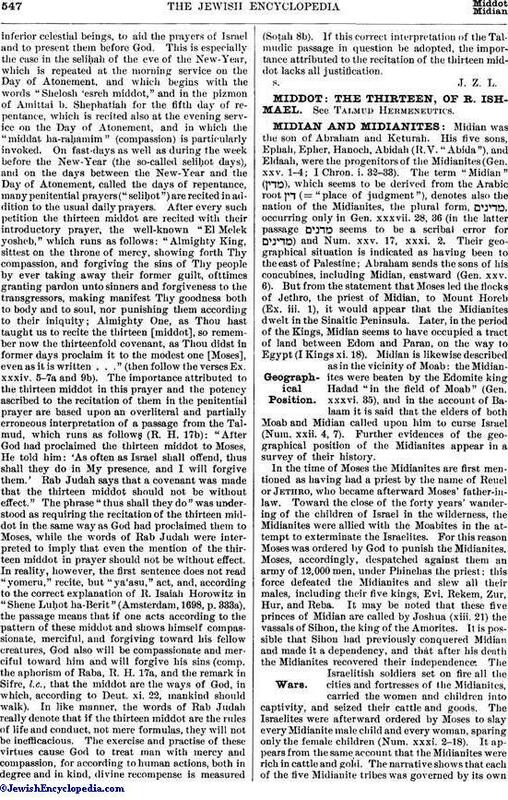 The phrase "thus shall they do" was understood as requiring the recitation of the thirteen middot in the same way as God had proclaimed them to Moses, while the words of Rab Judah were interpreted to imply that even the mention of the thirteen middot in prayer should not be without effect. In reality, however, the first sentence does not read "yomeru," recite, but "ya'asu," act, and, according to the correct explanation of R. Isaiah Horowitz in "Shene Luḥot ha-Berit" (Amsterdam, 1698, p. 333a), the passage means that if one acts according to the pattern of these middot and shows himself compassionate, merciful, and forgiving toward his fellow creatures, God also will be compassionate and merciful toward him and will forgive his sins (comp. the aphorism of Raba, R. H. 17a, and the remark in Sifre, l.c., that the middot are the ways of God, in which, according to Deut. xi. 22, mankind should walk). In like manner, the words of Rab Judah really denote that if the thirteen middot are the rules of life and conduct, not mere formulas, they will not be inefficacious. The exercise and practise of these virtues cause God to treat man with mercy and compassion, for according to human actions, both in degree and in kind, divine recompense is measured (Soṭah 8b). If this correct interpretation of the Talmudic passage in question be adopted, the importance attributed to the recitation of the thirteen middot lacks all justification.